Clarease is Kevin's paternal grandmother. This page is under construction and will be expanded. Beulah Clarease Nichols was born on 28 Dec 1909 in Kansas City, Kansas, the third of six children of Clinton Wakefield Nichols and Grace Annis Gwartney. The family lived in Kansas City, where Clarease graduated from Wyandotte High School. She was a member of the Armourdale Baptist Church, where she was active in the state Baptist youth group. Clarease attended Ottawa University, where she met her future husband, Harry Lee Ireland. They married on 12 Aug 1934 in Kansas City, Kansas; they were 24 years old. 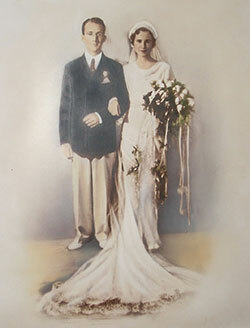 After they married, Harry and Clarease lived in Parsons, Kansas; Kansas City, Missouri; and Ottawa, Kansas - with children born in each of those communities. They returned to Parsons in 1945, where they lived for many years. Clarease was very active in her church and community. She was a member and church secretary at the First Presbyterian Church, where she also served as an elder and deacon. She was a leader in the church's women's group and was a Sunday School teacher. 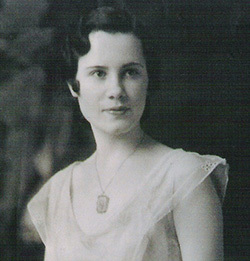 She and her husband served as sponsors of the Westminster Fellowship youth group for several years. Clarease served on the Parsons Board of Education for a number of years and was its president for a period of time. She was active in Church Women United, serving as its president, and was awarded that group's Valiant Woman Award. Clarease was a 50-year member of PEO, being active in Chapter B.S. of Parsons and serving as its president as well as holding other offices. She was on the recreation board in Parsons for a number of years, serving as president, and was also active in Alpha Club for many years. She was very involved in the Parent Teacher Association while her children were young, serving on the state board for 10 years. She was selected as Southeast Kansas Mother of the Year in the early 1950s. Clarease taught junior high English and typing in the Parsons school system. She was actively involved with the Parsons Presbyterian Manor, visiting residents often and serving on its board. In 2000, Clarease left her beloved Parsons, where she had lived for more than 50 years, and moved to Friendship Village, a retirement home in Bloomington, Minn., near where one of her daughters lived and where she enjoyed the many activities for seven years. Clarease became a resident at Walnut Hills Retirement Home in Walnut Creek OH in 2007. There, she was able to enjoy daily visits and weekly overnight stays with another one of her daughters. Highlights of her retirement years were family trips to Ireland four times and family reunions in Mexico, Florida, Estes Park, Colo., and Santa Fe, N.M., to celebrate birthday milestones. Clarease loved being with her family and cherished their times together. After her husband Harry's death in 1990, Clarease sold their large family home and moved into a smaller home in Parsons where she lived for several years. She eventually moved to Minneapolis MN to live in an assisted living facility near her oldest daughter. Later, she moved to a home in Ohio close to her second daughter where she lived her remaining years. 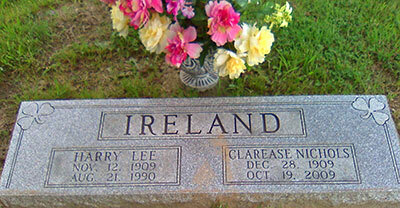 Clarease died on 19 Oct 2009, two months before her 100th birthday. She's buried next to her husban in Oakwood Cemetery, Parsons, Labette County, Kansas. 1910 U.S. Census in Kansas City, Wyandotte County, Kansas on S. Mill St., at age 0 - along with her parents and two older siblings, Harold and Leona, her uncle Archie Nichols, and her father's (?) cousin Grover C Wages. 1915 Kansas state census in Kansas City, Wyandotte County, Kansas at age 5 - along with her parents and siblings Harold, Leona, Vivian and Paul. 1920 U.S. Census in Kansas City, Wyandotte County, Kansas on Gilmore Ave, at age 10 - along with her parents and all five siblings: Harold, Leona, Vivian, Paul and Maxine. 1925 Kansas state census in Kansas City, Wyandotte County, Kansas at age 15 - along with her parents and five siblings: Harold, Leona, Vivian, Paul and Maxine. 1930 U.S. Census in Kansas City, Wyandotte County, Kansas on S. Bethany, at age 20 - along with her parents and all five siblings: Harold, Leona, Vivian, Paul and Maxine.